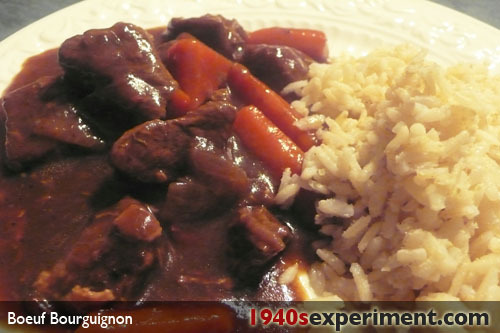 Julia Childs cooked Boeuf Bourguignon in the 1940’s. Having watched Julie & Julia on DVD again last night, the pain of watching this dish being prepared led me to spend an hour ‘Googling-to-within-an-inch-of-my-life’ into the early hours of the morning, wondering if there was a way to replicate this dish in anyway while still keeping within my allotted ration quota. As I type, the Boeuf Bourguignon, a la Julia Childs, a la wartime rationing (cheap stewing beef instead of sirloin, standard onions instead of pearl and NO mushrooms!) is smelling wonderful and my Mac Book Air is holding up well under the excessive saliva bath it is receiving. 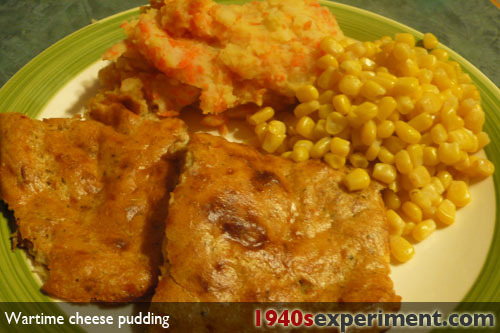 The recipe is not quite authentic Julia Childs but essentially it is pretty much the same. 7.29 pm precisely – Nom, Nom, NOM!!!! This is fantastic! Who would think that big chunks of stewing beef could be so melt in the mouth. I am still noming…Nom, Nom, NOM!! While I struggle to get to grips with my sweet tooth and portion size following the Christmas, New Year, marriage separation anniversary and 4 birthdays cakes BLIP (so I actually have some weight-loss results to post on the blog) here is a tasty and simple recipe. 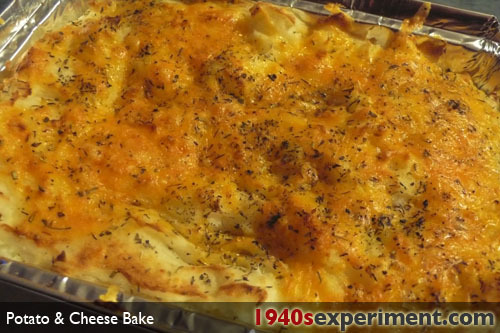 This no-fail recipe is bound to have the family kissing your feet (even if they are stinky) and pledging a life of devotion to your 1940’s cooking if you’ll “just-cook-some-more-of-that-again”.. It’s like some sort of cat nip for kids (they need it, they want it, they have to possess it…) except it calms and satisfies them and stops them demanding potato chips for at least 3 hours. This HAS to be a good thing. 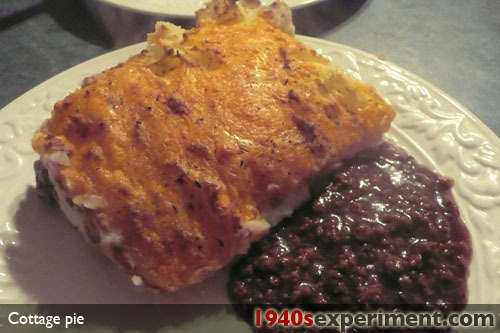 This particular recipe is something I have just put together and is not out of any particular cook book however it does use my rations fairly wisely as well as lots of potato- the Ministry of Food would be so proud of me.. Note: I used 12 large potatoes to serve 4 generously using a 10 x 8 inch pan for baking. Cut into 1/2 inch chunks. Place into salted cold water and bring to boil on stove, simmering until chunks are tender. Add in a large blob of butter (the bigger the better if rations allow). Taste potatoes adding plenty of salt and pepper until you get the required taste. Add a little milk and mix with wooden spoon until you get the required consistency. Add into baking pan and spread out evenly. Rough top with a fork. Grate 4 oz of strong/sharp cheese. Sprinkle evenly over the top. Finally sprinkle generous quantities of herbs, lots of thyme and a little rosemary work well together. Don’t skimp! Place in pre-heated oven at 200 C for 25 minutes and finish off under a hot grill/broiler for 5 so the top browns. Remove, let stand for 5 minutes or so and then serve. Goes well with meat, veg and gravy. And now you have your family subdued and totally under your spell it’s time to put your feet up, open a good book and savour the quietness of your home…. Eldest hobbit …. ” Jeremy (boyfriend) wants to hire you as a cook”.. Try this fabby, tasty, tummy filling, stick to your ribs meal- it is worth the effort! Place in salted hot water and bring to the boil until tender and drain. Serve with steamed fresh veggies! I did try to improve it’s nauseous qualities in photoshop but unfortunately I am unable to work miracles. 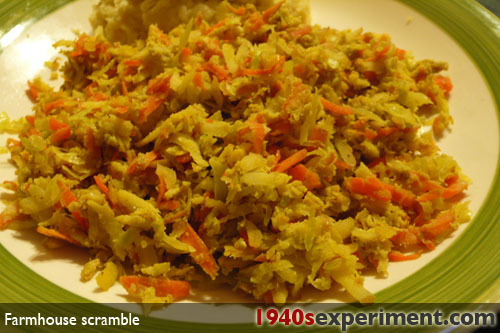 I will have to just live with the plain truth of the fact that the Farmhouse Scramble (1) recipe in the book “Feed the Nation” by Marguerite Patten OBE is one of the less attractive home front recipes. As it tastes somewhat nicer than vomit I will forgive her.. 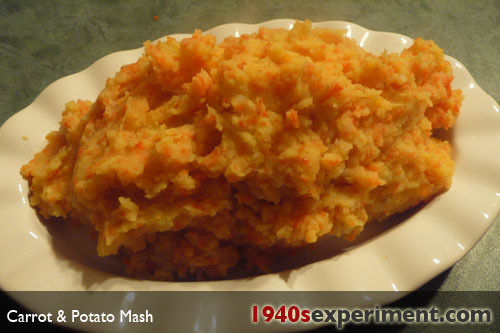 Serve with potatoes or in a sandwich or on toast! PS: I am thinking that there are a number of visitors to my blog who are interested in food and frugality. You maybe interested in a recipe I cooked today for ‘Fabby & Frugal Breakfast Muffins’. 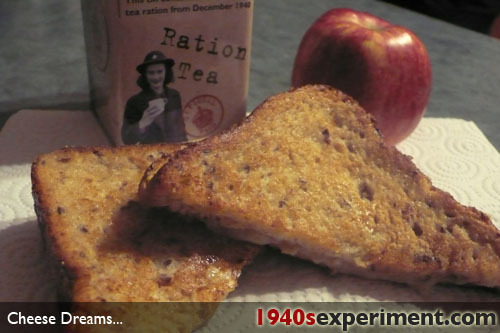 The ingredients I used were available in my ration but because I couldn’t find a recipe for muffins during WWII I just couldn’t post it in my blog as an authentic recipe- CLICK HERE to check it out!